» Is the U.S. Men’s National Team Getting Better? Is the U.S. Men’s National Team Getting Better? The United States men’s national team has never been deeper. There are at least 50 players who could contend for spots on the 2015 Gold Cup, 2016 Copa America, or 2018 World Cup rosters. Throw in a handful of younger players in the under-20 ranks and you find a Stars and Stripes squad that might not have the top-end talent of the 2002 quarterfinal-reaching roster, but possesses plenty of potential. That the quality of American soccer trends upward shouldn’t be news to anyone reading this column. The resources dedicated to producing talent are starting to pay off with more starts than fits. It’s a process that’s far from complete, but the development academies, the growth of MLS, some impressive dual-national recruiting, and a variety of other factors are the reality that has head coach Jurgen Klinsmann saying he wants to reach the semifinals in Russia. How realistic is that goal? To achieve it, Americans not only need to improve, but improve faster than their nearest competition. The team needs to grow from an also-ran on the international stage to a world power. Are they? Is the U.S. catching up to the perennial powers like the Germanys, the Argentinas, the Spains, or even the up-and-down squads such as the Netherlands and Belgium? That’s a much less sure proposition, and one that’s harder to gauge. The red, white, and blue are 17th in the FIFA world rankings — down four places from the beginning of the year, but up 17 from the end of 2011. Since the rankings debuted in 1993, the U.S. has bounced around from a high of fourth in April 2006 to 36th in August 2012. The team averaged 19th place, pretty close to the current position but well below CONCACAF rival Mexico (14th), which is currently 16th. In terms of ranking, the Americans haven’t shown much upward momentum, but everyone knows the FIFA rankings — like Sepp Blatter’s opinions — are only roughly correlated with reality. The Elo system, which takes into account all matches, is regarded as a superior means of appraisal. In those, the U.S. finds itself in 15th with 1,827 points, sandwiched between Portugal and Costa Rica. (No. 1 Germany has 2,176 points.) While that place feels about right for now, the historical trends show something surprising. When averaging the Elo ranking across a decade, the United States does not appear among the top 20 team for the 2010s. During the 2000s, however, the Americans were on average the 16th-strongest team with 1,790 points, between Romania and Ireland. In July 2009, the Stars and Stripes posted its highest-ever Elo rating of 1,871, a result of the surprising and impressive run to the final of the Confederations Cup, during which the squad snapped no. 1 Spain’s 35-match unbeaten streak. That doesn’t mean the team of the 2000s was stronger than the current group when compared to the rest of the world, but it’s a point in its favor. Not wanting to settle for numbers, figures, and complex formulas, I called up Jonathan Wilson, author of the brilliant and comprehensive history of tactics Inverting the Pyramid to ask for his impressions about the American squad and the 2014 World Cup. That’s only a few games’ worth of observations, but “a small team fighting hard” is a statement with which anyone who regularly watches the U.S. will be familiar. For the past decade, that’s been the team’s M.O., no? It was great that they got through group play. I don’t think there was anything on the playing side that you can point at that was really notable. The fight, the desire is there, the goalkeeping was excellent. The inability to pass with any kind of quality was a glaring weakness. Producing chances, having any kind of possession was really a knock against the team. They were poor in those areas. Having said that, they managed to get a win and a draw out of four games — that’s pretty remarkable. We are not in position to play against top teams. We can give it a good effort, a good fight. It’s in Arena’s best interest to make that argument — he did coach that team — but he’s not entirely wrong, either. 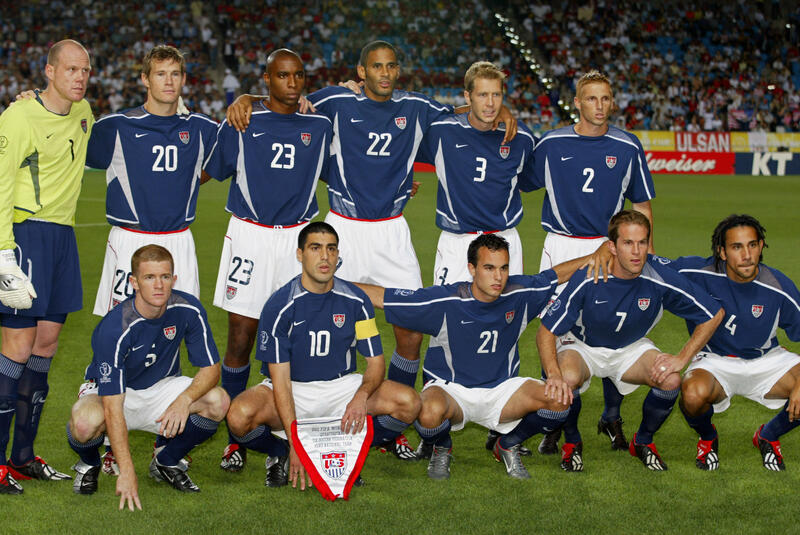 The ’02 squad played consistently attractive, attacking soccer, reaching the quarterfinals before outplaying and very nearly upsetting Germany to reach the semis. Then again, without Park Ji-Sung’s gorgeous but unnecessary goal against Portugal, the Americans don’t make it out of the group stage. The World Cup will never be the best indicator of talent levels. All international soccer teams are subject to ebbs and flows. Wilson cited the Dutch squad, which had a golden generation in the 1960s, again in the 1980s, and is full of exceptional players once again. The Belgian outfit that defeated the U.S. in Brazil provides another example. A concern for the Americans is that the golden generation might have already come and be aging out. Consider that Landon Donovan, Clint Dempsey, DaMarcus Beasley, Kyle Beckerman, and Jermaine Jones are all between the ages of 30 and 32. Throw in national team contributors including Oguchi Onyewu, Eddie Johnson, Chris Wondolowski, Brad Davis, Brad Guzan, and Clarence Goodson, and you have one of the best three-year periods in U.S. soccer history. Is another Donovan, Dempsey, or even Beasley coming through the ranks? Perhaps, given the potential of some of the players, but the outlook doesn’t look great, and you’d be hard-pressed to find three players to match up. If the Americans have one advantage, it’s the relative youth of the program and the size of the country. “Just by the numbers, you would think the U.S. would eventually catch up if they care about it, which they are slowly starting to do. You don’t need a big section of the population to be strong,” Wilson said, citing the U.S.-Belgium match, in which a nation of 8 million easily outpaced one of 320 million. In other words, the semifinals might have to wait. Cousin Sal’s Week 6 Prop Bets!